The last few weeks have been quite the whirlwind! We are delighted to share welcomed news of the unveiling of LABYRINTH SUBLIME and of the imminent release of the first copies to Subscribers. 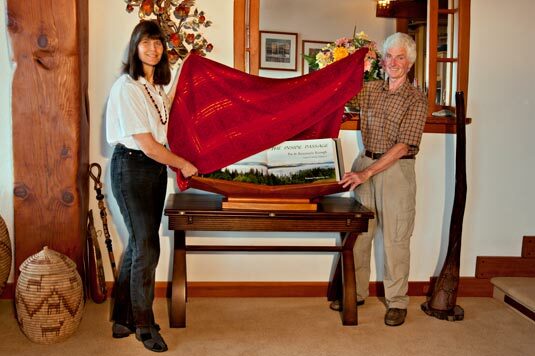 LABYRINTH SUBLIME: THE INSIDE PASSAGE was unveiled with due ceremony during The Explorers Club Salt Spring Symposium, an intellectually stimulating gathering of fifty Explorers, all members of this prestigious, international club. We both are Fellows of The Explorers Club; Rosemarie being a Medalist and Director of the Canadian Chapter. 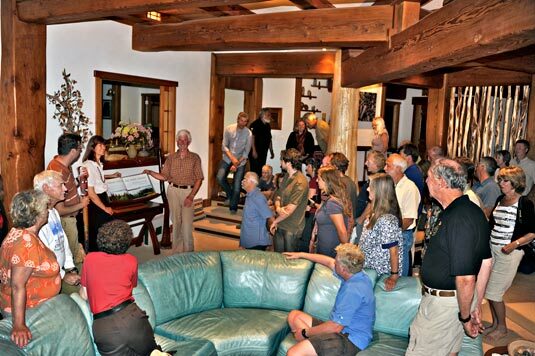 During this four-day retreat held at our home, presentations are shared of cutting-edge research from a wide range of disciplines from searching for dinosaurs on all continents to studying the stars. Among this year’s participants were no less than five subscribers to LABYRINTH SUBLIME , nine proof-readers, and a further two who generously contributed much logistical assistance during our photography. Kept under wraps this entire time, we decided the evening program of September 10th to be an appropriate venue to unveil LABYRINTH SUBLIME . Foremost among those who have been involved with LABYRINTH SUBLIME already a decade ago is Explorers Club member and symposium participant Jim Allan. To Jim, his wife Jean and sons we have dedicated this volume in gratitude for the many fine summers of exploration of The Inside Passage together with their family aboard their stalwart sloop the Morgaler. Among the experts well versed in the science of the Pacific Northwest who thoroughly proof-read and/or fact-checked our work are several Explorers Club members including: Cathie Hickson, volcanologist; Rob Butler, ornithologist and ecologist; John Harper, coastal geomorphologist; Mary Morris, marine ecologist; Tom Reimchen, biologist and ecologist; Bristol Foster, biologist and film maker; Steven McGehee, ornithologist; Gerald Holdsworth, glaciologist; Anthony Dalton, exploration historian; Chris Darimont, carnivore and conservation biologist; Alistair Linn, geologist; and Robie Macdonald, oceanographer. Although the text in our volumes is minimized so as to give priority to imagery, the facts and inferences must be accurate to the expert, while still being a good story that is readable for everyone else. We are indebted as well to symposium participants Ron Zuber, renown speleologist home-based in Anacortes, Washington, who kept us abreast of the snow geese migration as well as the daffodil and tulip bloom on the Skagit Flats; and Glenn Helmlinger and Brian Brett both of whom have a fine eye for proof-reading and editing. As such, it was quite fitting to lift the red cloth off LABYRINTH SUBLIME during the recent symposium. In the photo above, you see the two of us with LABYRINTH SUBLIME open to the title pages, telling of some of our insights and adventures to the explorers gathered in our living room as part of the unveiling. Below is a better rendition of just the facing title pages. This is, in fact, the view from our kitchen looking north from Salt Spring Island across the Inside Passage toward mainland on a morning of mist and cloud. To us this speaks of the essence of this coast with its forest, islands, mountains and protected waterways. AND......We will be releasing LABYRINTH SUBLIME to all Subscribers soon. The first release will be within two weeks. Throughout October and November we will be contacting all Subscribers as we are ready to ship to reconfirm courier addresses. Since the previous update, the hand binding of Subscriber copies of LABYRINTH SUBLIME has been completed, and the making of linen-and-velvet presentation boxes is well underway. We thank Felton Bookbinding for their generous advice and assistance to Friesens with the initial box production which has sped the release. We thank Friesens for their unwavering dedication to excellence for our project, both the printing and the boxes. So not too much longer now! When Subscribers receive their tomes we trust that they will agree that the extra-ordinary effort, minute attention to detail, and consequently the wait, has been well worth it. In closing tonight’s missive we thought to include comments from a few of the mentioned scientists who know this coast so well having spent decades working along The Inside Passage. The following is their reaction upon proof-reading advance digital files of LABYRINTH SUBLIME. Your new book is stunning! I couldn’t put it down until I had run through all those delicious images. The images left me spell bound. They are so rich with stories of their own. The juxtaposition of form, colour and perspective shows the coast in a way I not seen before. They do for this coast what Ansel Adams did for the Sierras. I read your preface and it flows like honey. Like your images, the text is somehow crisp and pastel at the same time, conjuring up in this reader the exact feelings I think you intend. I’ve stood on the side of a ship pulling water bottles while katabatic winds rushed down the inlet, spent countless hours in shoals sitting placidly in a kayak suspended over urchins and starfish, I’ve seen those fish traps and wolf tracks, and I’ve tramped the coast forests and mountains. I’m just dumbfounded. I might well have said something about every image as they all merge emotion, thoughts and memories. Love, love, love that Spirit Bear shot. The best ever. Bar none. This was a joy to read. You guys totally get it. Through your text and images you have truly captured the sense of place. Fantastic!